Earlier this year New Hampshire’s Tea Party controlled House of Representatives passed a bill mandating that doctors inform women that abortion increases the risk of breast cancer. There’s just one problem: there’s no scientific evidence that this claim is true, and copious evidence that it is not. The bill, sponsored by Rep. Jeanine Notter (R-Merrimack), was immediately condemned by Democratic leaders, who it would require false information to be spread by doctors to patients. There is no proven breast cancer link to abortion, according to the World Health Organization and the American Cancer Society. Materials that inform the pregnant woman that there is a direct link between abortion and breast cancer. It is scientifically undisputed that full-term pregnancy reduces a woman’s lifetime risk of breast cancer. It is also undisputed that the earlier a woman has a first full-term pregnancy, the lower her risk of breast cancer becomes, because following a full-term pregnancy the breast tissue exposed to estrogen through the menstrual cycle is more mature and cancer resistant. In fact, for each year that a woman’s first full-term pregnancy is delayed, her risk of breast cancer rises 3.5 percent. 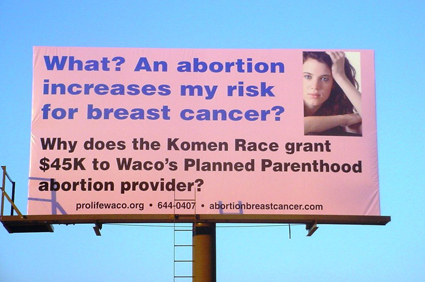 The theory that there is a direct link between abortion and breast cancer builds upon this undisputed foundation. During the first and second trimesters of pregnancy the breasts develop merely by duplicating immature tissues. Once a woman passes the thirty-second week of pregnancy (third trimester), the immature cells develop into mature cancer resistant cells. When an abortion ends a normal pregnancy, the woman is left with more immature breast tissue than she had before she was pregnant. In short, the amount of immature breast tissue is increased and this tissue is exposed to significantly greater amounts of estrogen—a known cause of breast cancer. Women facing an abortion decision have a right to know that such medical data exists. At the very least, women must be informed that it is undisputed that pregnancy provides a protective effect against the later development of breast cancer. The bill essentially acknowledges that there is no direct link between abortion, while simultaneously mandating that doctors tell women there is a link. The bill also acknowledges that there is no scientific evidence to support the claim of a link, merely a theory premised on related information. It’s easy to recognize what is going on here. In an effort to convince women not to have abortions, anti-choice activists are lying about the risks of abortion. Natural childbirth advocates practice the same reprehensible technique. In an effort to convince women not to have epidurals for pain relief in labor, natural childbirth advocates claim that epidurals harm babies. Just as in the case of abortion and breast cancer, there is no scientific evidence to support a link and copious scientific evidence that babies experience no harm from epidurals. Indeed, in the past 3 decades literally tens of millions of babies have been born after their mothers received epidurals, but activists cannot point to even a single individual who has been harmed. Nonetheless, just like the Tea Party in New Hampshire, they continue to push scurrilous theories about the “risks” of epidurals. Increased likelihood of newborn septic workup, IV antibiotics and isolation in the nursery if the mother develops an “epidural fever” that causes fetal tachycardia or newborn fever. If the fetus is already stressed greater amounts of the medication are “trapped” in the fetal circulation, leading to more pronounced newborn effects (see below). Short-term (six weeks or less) subtle neurobehavioral effects, such as irritability and inconsolability and decreased ability to track an object visually or to shut out noise, bright light.4 There are no data on potential long-term effects. Possible less efficient or less organized initial rooting and suckling behavior. Nurses have reported more difficulties in feeding babies whose mothers had an epidural when compared to unmedicated babies. Epidurals do NOT cause abnormal heart rate patterns. Decreased blood pressure in the mother might cause a temporary change in fetal heart rate, but that is easily treated by giving the mother additional fluid. Epidurals are less likely to lead to a newborn septic workup than prolonged rupture of membranes, but natural childbirth advocates think prolonged rupture of membranes is not a reason for concern. There is no evidence that medication is “trapped” in the fetal circulation leading to newborn effects. In fact, despite the above lies, there is no evidence that epidurals have any harmful effects on breastfeeding or other newborn behavior. No matter, in the world of natural childbirth advocacy, as in the world of anti-choice advocacy, the truth is irrelevant. What’s an expectant mother to think? If you want to have an epidural, have an epidural. If you don’t want to have an epidural, don’t have an epidural. Just keep in mind that the claim that epidurals harm babies is a bald faced lie on par with the claim that abortions cause breast cancer. It is meant to take away YOUR choice to control your own pain or your own body, and substitute the choice of advocates who have an agenda very different from helping you to make an informed decision. ← Are we supposed to be impressed you risked your baby’s life at homebirth? Is the risk of hypertension related to the mother’s regular blood pressure?